Not sure how to explain SB 5052 to your friends? Here’s an informational sheet highlighting just some of the changes coming with the bill. For example, we forgot to mention that SB 5052 makes PATIENT to PATIENT delivery and exchange a felony! Together, we can help prevent our rights from taken from us. Remember to spread the word! Doctors who authorize patients are leaving the state faster than you can say July 24th. Contact your authorization clinic or favorite access point and ask for their support in fighting further enactment of 5052. A very special thank you to all the patients at South King Holistic for showing such great support. Thank you to everyone donating on behalf of a close one without access to GoFundMe. If you would like to volunteer your time, contact us at saveaccesswa@gmail.com! 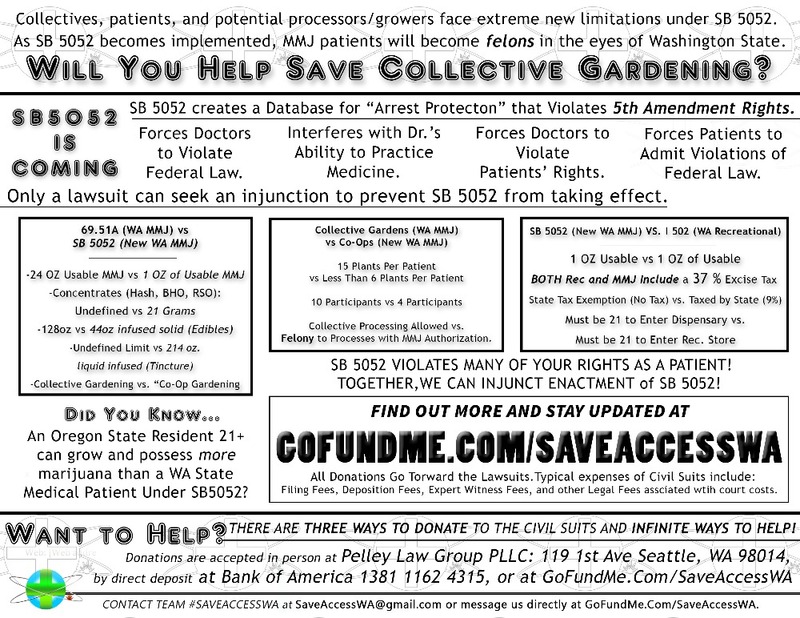 Help Support Lawsuits Fighting for Injunction Against SB-5052 Signed by Gov. Inslee, a law that has proven harmful to the MMJ patients it should be helping, in Washington State: Laywers Jeff Steinborn, Aaron Pelley, and Douglas Hiatt are joining forces to attack the recently passed law that decimates medical marijuana rights and access in Washington State. Passed as 5052 and partially enacted, the remaining provisions are unacceptable to Doctors, Patients, and the folks who help them with growing and access points. The lawyers plan to seek an injunction to stop the law from taking effect, and then continue to pursue the lawsuit to determine the ultimate constitutionality of the law. As many as three or four separate lawsuits are possible, including a suit to stop the “Enforcement Priorities” ordinance soon to be at the City Council in Seattle. This lawsuit could stop the closure of over 60% of Patient access points in the City which is currently planned under the Mayor’s proposal. These lawsuits represent the best chance to stop the law from taking further effect, resulting in devastating consequences to Patients and Doctors. Please help save meaningful access and legal protections for Patients. All donations help and will be put towards the lawsuits.